The subtitle reads: Containing explanations of all the tricks and deceptions with playing cards. 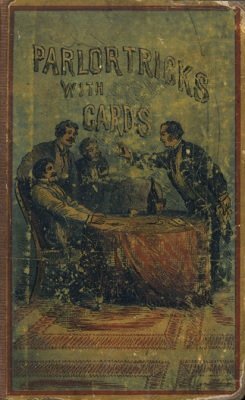 Tricks with cards performed by skillful manipulation and sleight of hand; by the aid of memory, mental calculation, and the peculiar arrangement of the cards; by the aid of confederacy and sheer audacity and tricks performed by the aid of ingenious apparatus and prepared cards. The whole illustrated, and made plain and easy. The first section of this book is identical with the card section in The Secret Out . The False Double Shuffle, or Four Methods of shuffling Cards in such a manner as always to keep one certain Card at the Top or Bottom of the Pack. Who has the best Husband? 1st edition 1863, 130 pages; PDF 106 pages.